In 2016, per capita income growth in sub-Saharan Africa turned negative for the first time in the 2000s. Thanks to the recovery of oil prices, the outlook since 2017 has been more optimistic. In its May 2018 Africa Regional Economic Outlook, the International Monetary Fund (IMF) projects that the region’s GDP growth would rise 3.4 percent in 2018, 0.6 percentage points higher than in 2017. Other forecasts are similar: The World Bank projects growth rates of 3.1 percent in 2018 and an average of 3.6 percent in 2019-20. All this looks encouraging. But these growth rates won’t be enough for Africa to reach the Sustainable Development Goals. And it is downright depressing to compare Africa’s economic performance with what’s been happening in other parts of the world. During the last quarter century—the best time ever for the developing world—the African subcontinent fell further behind (Figure 1). Now, with tougher times ahead for the global economy, it is fair to ask whether Africa has missed its big chance? Source: Authors’ calculation based on data from the World Bank’s World Development Indicators. This is the question we tried to answer in our recently completed paper. This post provides a glimpse of some of its findings. We conclude that sub-Saharan Africa has three critical deficits: low levels and poor quality of education, low levels of electrification, and low levels of domestic revenue mobilization. These deficits are at the core of all other problems on the continent and—if left unaddressed—will make sustained development in sub-Saharan Africa nothing more than wishful thinking. In the paper, we suggest possible solutions. 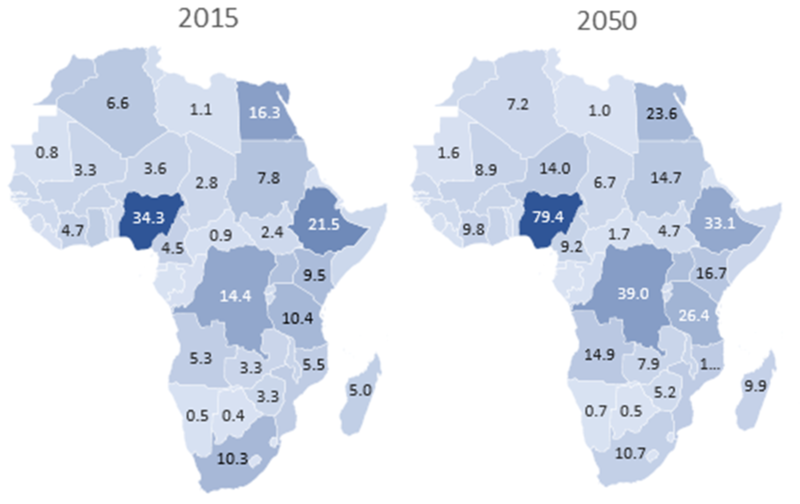 Demographers predict that the number of youth in sub-Saharan Africa will double to 400 million by 2050; in Nigeria, the number will more than double from less than 35 million to almost 80 million. Development specialists see this as Africa’s big chance to make up lost ground. McKinsey Global Institute’s Lions on the Move II points to an association between increasing working-age populations and economic growth, and argues that aging is the greatest risk in the rest of the world. This is not true for Africa. By 2100, half the world’s youth will live in Africa. Source: Authors’ calculation, based on the United Nations World Population Prospects, the 2017 Revision. Theoretically, a rapid increase in youth population could lead to an increase in savings, higher productivity, and faster economic growth. But for this to happen, people have to be healthy and skilled. Rapid growth in the number of young people necessitates rapid improvements in access to education and its quality. Most countries in Africa have not created these conditions. Students in sub-Saharan Africa have the lowest educational attainment. Sub-Saharan Africa now ranks at the bottom of all regions in school gross enrollment rates, but access has been improving. Not so for education quality. For instance, pupil-teacher ratios in primary education in sub-Saharan Africa have worsened since 1970, while they improved everywhere else. There is no high-income economy with low levels of education. The backbone of sustained and inclusive development in Africa is education reform. The lack of education is at the core of most development problems. There is no high-income economy with low levels of education. The backbone of sustained and inclusive development in Africa is education reform. Eliminating the major development problems, which must include improving the quality of institutions, reducing corruption, better health outcomes, a less informal economy, less youth unemployment and fewer civil conflicts, will be a long journey. The first step must be to ensure that every African child gets a decent education. Schools, health facilities, and infrastructure all require electricity. Operating a factory, running a shop, or growing crops is impossible without using energy. Countries where access to electricity is 80 percent or higher are either high- or upper-middle income countries; nearly all countries with access ratios below 80 percent are low-income economies. 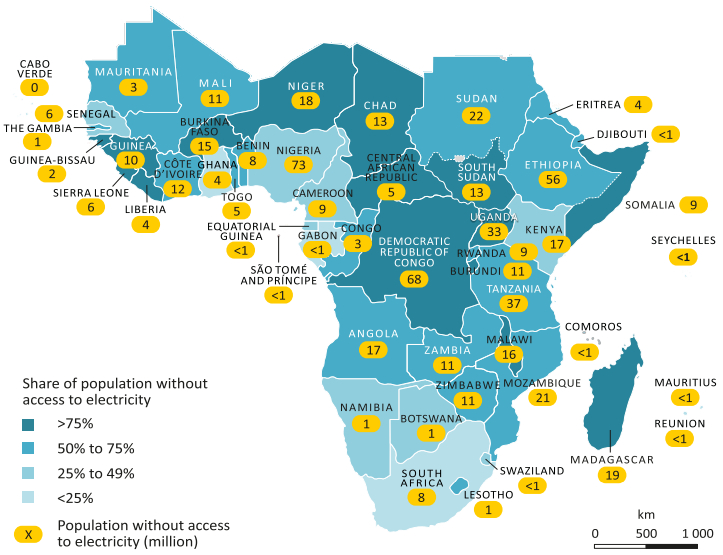 Sub-Saharan Africa is rich in energy resources, but it is starved of electricity. Nigeria is illustrative of the continent’s problem: A lower middle-income economy with immense energy resources, Nigeria has 73 million people without access to electricity. Even in South Africa, an upper middle-income economy, 8 million people live without electricity. According to the World Energy Outlook 2017, some 588 million people in sub-Saharan Africa—more than half of the region’s population—did not have access to electricity in 2016. Across the world, about 1.06 billion people were living without access to electricity in 2016—more than half of whom were in Africa. Source: International Energy Agency (2017), Energy Access Outlook 2017. The region’s power sector is underdeveloped in all aspects—energy access, installed capacity, and overall consumption. The electrification rate in Africa’s urban areas averaged 71 percent while that in rural areas was only 23 percent. This makes all the difference because two out of three Africans still live in rural areas, and—unlike in other parts of the world—rural populations in Africa are still expected to grow. Sub-Saharan Africa is rich in energy resources, but it is starved of electricity. Africa has been getting an average of about $40 billion in foreign aid every year, a sum higher than the GDP of 41 of the region’s 48 economies. But aid does not seem to have been a catalyst for change in the subcontinent. The reasons for this include weak institutions and aid fragmentation. But another harmful effect of aid on the continent is its impact on domestic revenue mobilization. Domestic revenue mobilization creates fiscal space for long-term investments, improves accountability, and reduces dependency on aid. In Africa, foreign aid may well have depressed domestic resource mobilization. The ratio of tax revenues to GDP is a decent proxy for domestic revenue mobilization. Figure 4 graphs tax revenues-to-GDP ratio by the income level of countries. Six countries have tax revenue-to-GDP ratios above 25 percent, but in 31, the ratio is less than 15 percent. Source: Authors’ calculation based on data from the World Bank’s World Development Indicators. Blue dots represent countries with tax/GDP ratios lower than 15 percent, green represents countries with tax/GDP ratio between 15 percent and 25 percent, and red represents countries with tax/GDP ratio higher than 25 percent. Sub-Saharan Africa underperforms every other region in terms of domestic revenue mobilization. The largest economy, Nigeria, is at the bottom of the list, with a tax-to-GDP ratio of less than 5 percent. Since Nigeria is an oil-rich country, the low level of tax-to-GDP ratio may be a problem when oil prices are high. But oil prices have been low more often than they have been high. Quality education, reliable energy, social services, and infrastructure require domestic resources, so an effective tax system is the sine qua non for sustainable development. Sub-Saharan Africa underperforms every other region in terms of domestic revenue mobilization. Our emphasis on education, energy, and taxes is not novel, and has been recognized by many Africa observers. This blog reports that the progress in these areas has been woeful—compared with what’s needed to attain modest development goals and relative to what’s being achieved elsewhere in the developing world. Our paper points out that Africa’s potential is undermined by low expectations, especially the thinking that annual average GDP growth rates between 3 and 4 percent are enough for successful development.